Life never seems to be the way we want it. There is no perfect life, but we can fill it with perfect moments. Enjoy every moment, dont wait for life to happen. Have an another wonderful day!!! To start a day is like painting, draw the lines with prayers. Erase the errors with forgiveness. Dip the brush with patience and color it with love. Thats the way to live! We are not the "doer" for any part of our life. We are the executors of a script written by Baba. The only thing we should run after is creating value and not wealth. Success of being a good human is judged by the impact you have created for others. Shirdi Sai Devotees, when we are having frustrations due to failure doesn't mean there is no hope for them. As long as we're alive and breathing, there are so many chances --- and opportunities will come. Just think: there are more people out there who have bigger problems than you do. Just be courageous enough to face the test of life. Baba Sai won't give you anything that you can't endure. If you believe Baba Sai loves you, then you will succeed not only in this earthly world but for your entire life with him." employers will be profited and there will be no room for lockouts. Just look up to Sai, you will be blessed! Shirdi SaiBaba devotees, Sai likes to know now & again what we want. He never forgets our needs as HE loves the surrender in our prayers always. 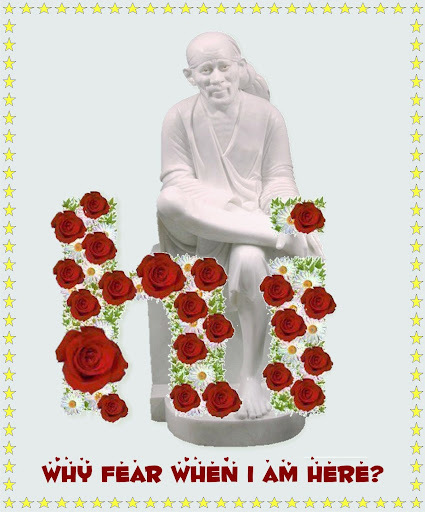 Love Sai.. Live in Sai.. When in a problem just say Sai...... He will come! No and Yes are two short words which need a long thought. Most of things we miss in life are due to saying NO too soon or YES too late. Sai likes to know now & again what we want. Sorrow looks back, worry looks around but Faith looks up.. where assurance is ! Life is "x+x+x"... Yesterday was an Xperience, today is an Xperiment, tomorrow is an Xpectation. So use your Xperience in ur Xperiment to achieve your Xpectation. good health means he is alchahol adiquit. I am leaving this month to give him a deaddiction tretatment. but i dont find anybody. still searching it and also i am searching for a house in coimbatore but i didnt get anything of Rs 2500.
coming to my email at least 3 times. I dont know what sai it trying to show us. I am in a confusion. whether i should get a house or baba wants me to come parthy or do i have to repair the house or should i take my brother to parthy these are questions are in my mind. Sorry sister once i received your emails then i feel happy at the same time i dont know what to do. sometimes i felt how baba is giving a test for me why its too much confusiton. why i am in this situation what to do with my mother? why why why? My dear and respected subhasrini sister,I would like your attention to two posts and the various responses. Please tell me if I was wrong in posting the original post, and whether saib ji's response was in an approiate tone.I do not mind me being scolded and chided.I just want to know your opinion so that I can correct myself.I bow before Baba with my fullest faith and devotion. Dear sister, Ravi ji has not written back or replied.I have posted another letter to you separetely addresssing your kindself,adwaita ji,drashta behen and sr moosa patel ji. Please help me. Kya apke ek shabdh ka kabil nahin hu. Raham karo subhasrini behen.